The Great Dane is susceptible to gastric torsion, hip dysplasia, heart disease and tail injuries. It is important that when contacting a Great Dane breeder that you express health concern issues and ask the breeder what they are doing in order to help mimimize them. Please don't purchase your Great Dane from a petstore which commonly are known to support Great Dane puppy mills. Doing so only promotes inproper breeding ethics and promotes current Great Dane health issues. The AKC, UKC, FCI, CKC, SKC, WWKC, FIC registries recognize the Great Dane breed standard. Country of Origin: Germany - depicted in drawings dating 2200 BC - Used as a war dog, bull-baiter, boarhound, body guard and companion. 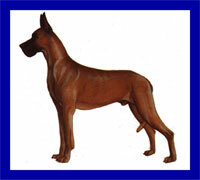 First shown under the name Siberian or Ulm Dog. Introduced to British in 1877. Introduced to US in mid 19th Century. Early specimens were reputedly ill-tempered - Americans credited with giving them dependable and stable dispositions. Temperment: This dog gets along well with children, other dogs, and any household pets. It is usually wary around strangers, but will welcome friends of the family. Care During shedding, remove dead hairs with a rubber brush. This dog will always need some place soft to lie down. Proper nutrition and avoidance of excessive exercise is required when this breed is young. Comments: Very docile, gentle giants that adapt well even to apartment living. Very people oriented, loyal members of the family. Respond well to training. Require involvement with family activities. Referred to by breeders as .